Knitting stuff and going on and on. : It Ain't Plain, Jane! 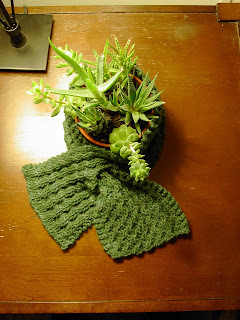 A great way to use up that skein of worsted you couldn't resist or the one that's left after finishing that sweater. Notes: CB2B = Slip one stitch to cable needle and hold to back, Knit the next stitch, then knit the one on the cable needle. 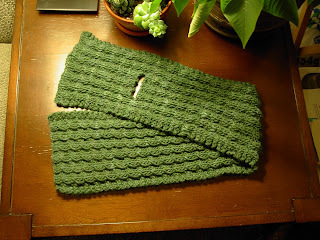 You will be working cables on both sides of the scarf which makes it reversible. ERRATA: If you want the small tight cables like in the photos above, only repeat Rows 1 - 4. I made a mistake when I wrote out the pattern and only caught it thanks to Emmybear. Otherwise your cables will simply look a little more elongated than mine. Row 1: Work 10 stitches in pattern, bind off 10 stitches, work remaining 10 stitches in pattern. Row 2: Work 10 stitches in pattern, cast on 10 sts, work remaining 10 stitches in pattern. Repeat Rows 5 - 10 in pattern another 6 times. Work Rows 1 and 2. Make sure that there is a good length left to cast off and to reinforce Keyhole. Then, with length of yarn, reinforce Keyhole all the way around to both strengthen it and to tidy the cast on edge and sides. Written by Dorothy Broderick. You may not distribute or sell this pattern without permission. You may make items for sale using this pattern so long as you agree to donate 5 dollars of the profits to your local Heart Association. Have I mentioned that I miss my good camera? 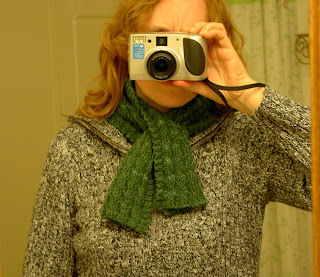 Ah well, hopefully the person who ends up with this scarf will be able to take better pictures for me. Loving your keyhole scarf, and I too have "several" lone balls that I could use up for family and friends etc. And I love the way it makes a great "cosy" for your plant. Thank you very much Dorothy for sharing this beautiful pattern!!! Great scarf! I don't know how I missed this post. I never was interested in the keyhole thing but I love the way that looks. nice work! L-oooooooo-ve working with malabrigo, it is so soft. What a nice pattern to show it off! The length of the entire scarf should be 26-28 inches..
At what length should I start the keyhole? I'm working with a bulky yarn, and only cast on 18 stitches. Very Lovely and so I have printed the pattern off and started right away, only to find out that the stitch counts in row 3 & 4 do not seem to be adding up? It very well could be the knitter and not the pattern...can anyone offer help? Found this great scarf! I am going to use some hand-dyed yarn that I just bought at Genesee Country Village in NY. They only had single skeins per color, so this is perfect! The Day after the Big Blank.